Home/panel extenders/Does a Messy Cubicle Lead to Better Organization? 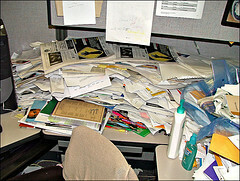 Does a Messy Cubicle Lead to Better Organization? Have you seen the controversial study showing that a cluttered workspace might actually make people more efficient? If not, you can read it here. Participants in the study had their organizational skills and cognition tested after sitting in a messy cubicle vs. a tidy one or one that was only partly cluttered. Participants who sat at the messy desk tended to come up with the simplest, most efficient strategies for organization. The working theory is that being exposed to clutter makes you crave simplicity. You have to streamline your thought processes so you don’t get overwhelmed. Are Sit To Stand Workstations the Wave of the Future?